“Spoilage is inhibited by its bitterness,” wrote a German nun in the mid 12th century. 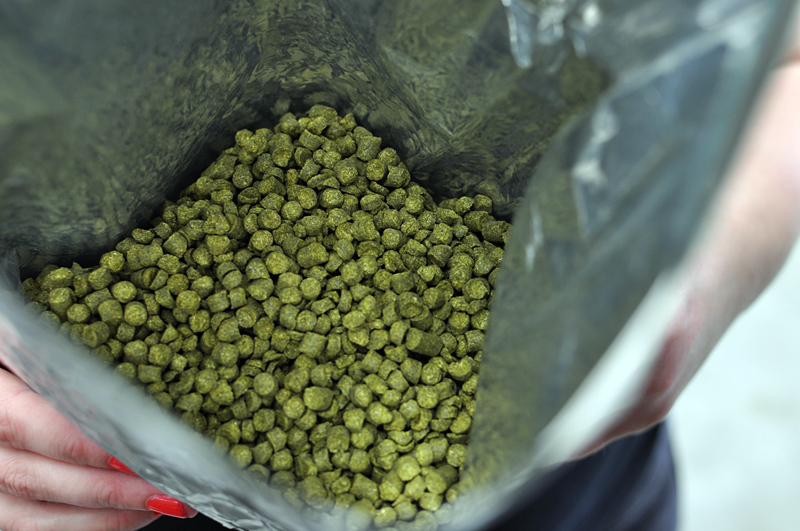 It is the earliest known document of western history that describes the preservative power of hops for use in beer. The author, Hildegard von Bingen, compiled two massive volumes of text known as Physica, detailing a vast array of natural sciences. Securing their importance to the history of brewing, the manuscripts include a couple of references to the use of hops in beverages such as beers and its power to increase the “black bile” of melancholy. A millennium later, in Hildegard’s honour, Australia’s women of beer have brewed an ale that relies on the preservative qualities of hops. They have crafted a Biere de Garde, a “beer for keeping”, named Hildegarde’s Biere de Garde. 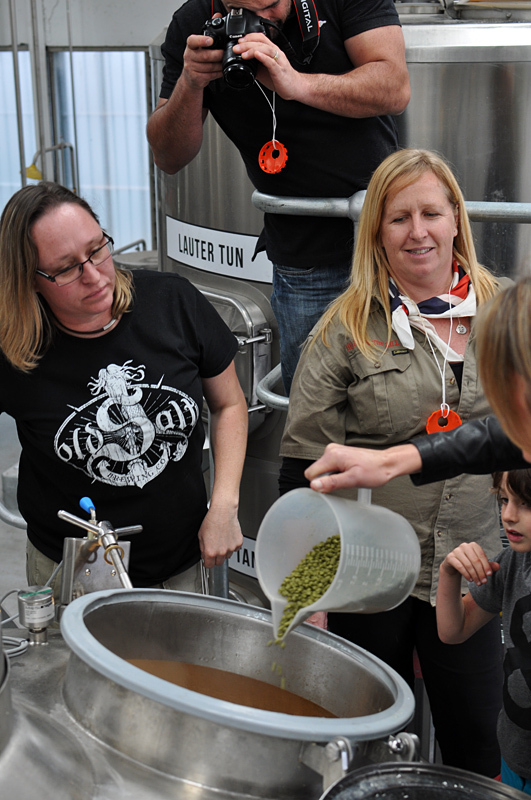 The Matilda Bay Brewery in Port Melbourne is usually closed on Sundays, but it was alive with activity on the first Sunday of this month as the local band of female brewers and beer industry women joined forces once again. 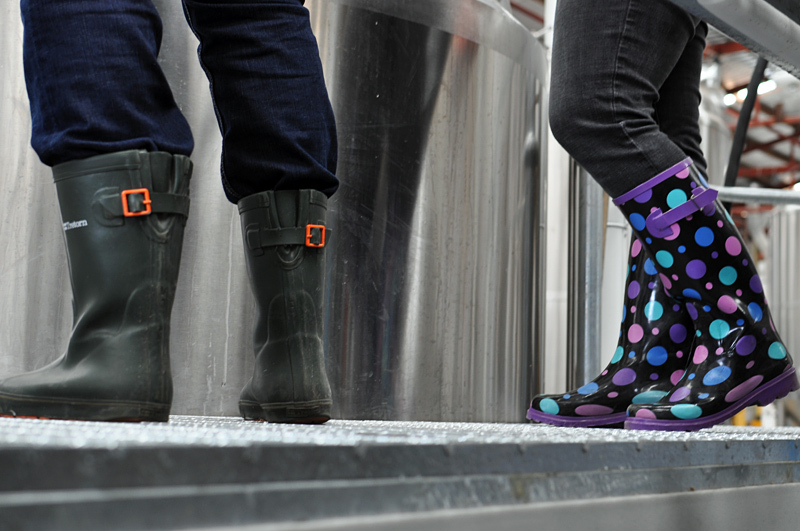 Matilda Bay’s brewhouse was handed over to the Women of Beer and the brewery doors were opened to the public to help celebrate Australia’s growing sisterhood of brewers and beer lovers. 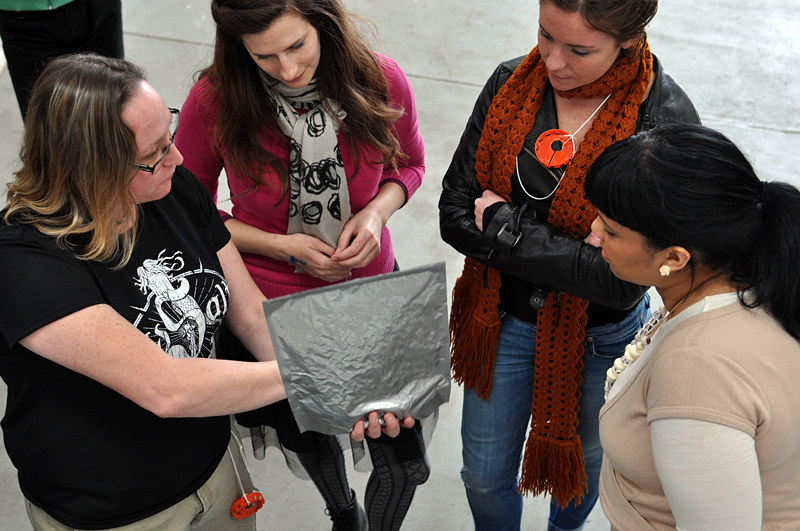 This year’s brew team consisted of Chloe Lovatt, Aine O’Hora, Sam Füss, Jayne Lewis, Karen Golding, Beth Williams. Tiff Waldron and Kirrily Waldhorn. They were joined by family, friends, industry representatives and the beer loving public who mingled over beers and a barbeque in the brewery bar. Biere de Garde is a style that this collective of female brewers and brewery owners have never been involved with brewing before, allowing an uninhibited approach to crafting a unique new beer in the tradition of French Farmhouse ales. The reference to Hildegard von Bingen, the prolific scribe and composer credited with authoring the first mention of the use of hops in making beer, was put forward by Beth Williams, a classically trained musician and the co-owner of Hargreaves Hill Brewing Company. Following on from last year’s brew of a Belgian Triple, named Ninkasi’s Angel, the aim was to again brew a complex and high alcohol beer that will complement food and provide a drinking experience to savour. It will be a special occasion beer and has been timed appropriately for Christmas this year. “We’ve used malt with really beautiful toffee aromas and hops with some spice, lemon grass and even a bit of cardamom,” explained Sam. They used predominately Pilsner malt with doses of specialty malts such as Vienna, Munich, Amber and Carraroma to craft a full and flavoursome body for the beer. 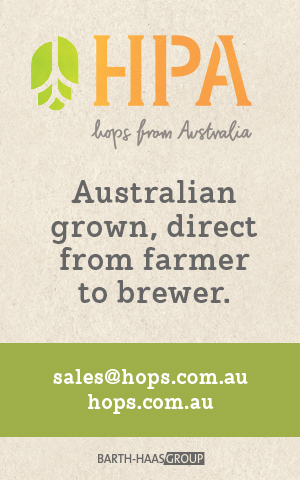 They used the French hops of Triskel and Strisselspalt, which were donated by Bintani, continuing their practice of utilizing hops varieties that are newly available to Australia. Strisselspalt also featured in last year’s Women of Beer brew, but the bittering hop of French Triskel has only recently arrived for commercial use in Australia. 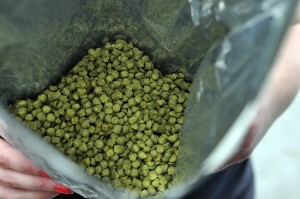 The first beer to feature the hop, the Hoppy Frog French IPA from Victoria’s Grand Ridge Brewery, was released earlier this month. It was a change of pace for most of the brewers involved. Unlike the manual adjustments and hands-on checking required through each stage of small scale craft brewing in the compact breweries on which most of the brew team commonly operate, the highly automated Matilda Bay brewhouse system reduced much of the brewing to pushing buttons and monitoring a touch screen. Unloading the bags of malt into the mill, measuring out hop additions and other ingredients were still a manual necessity and relished by the non-regular brewers, Beth, Kirrily and Tiff. 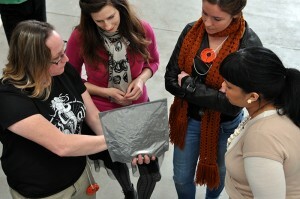 Sam Fuss displayed her endless passion for the brewing process in her interactions with the crowd. 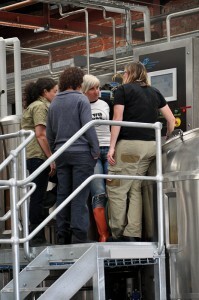 Throughout the day she explained in detail the role of each ingredient to the keen female members of the public who had attended the event and were invited for a close up look at the brewing action, as well as helping with measurements. When the day’s brewing wound down the DJ was turned up as the brewery bar party continued on a fine sunny Melbourne afternoon. 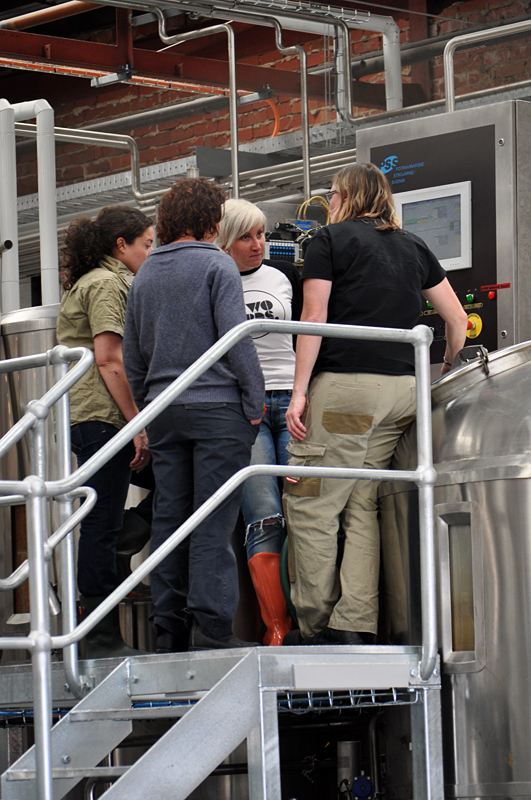 It was another successful brew day event for the Women of Beer. Sam Fuss explains the use of aroma hops to some punters during the Women of Beer brew day. Brewers Jayne and Sam returned to Matilda Bay last week and joined with Chloe to add the bagged French oak chips to the fermenters. It was the first time wood chips have gone into these Matilda Bay tanks. Hildegarde’s Biere de Garde is due to be bottled and launched in the coming weeks, released in 750ml bottles. 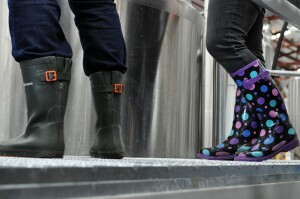 The beer supports the work of the Pink Boots Society.